The dashboard component is a new addition to Control 4.0, and one that we feel sure you will find useful. There are several actions associated with this new feature (explained below) that will help to organize the information in the dashboards, so please take advantage of these. You can also customize the instruments that are in the default dashboards for your own view. These buttons will allow you to add or remove columns in the dashboard view. The number of columns you can add is unlimited; however, we suggest having no more than three columns because the information in the instruments begins to get harder to read. Two columns seem to work very well for most people. This button allows you to add instruments to the dashboard you are currently viewing. Clicking the arrow button on the right will pop out a list of instrument categories, and each category will have the appropriate instruments listed. If Not Shared is visible, this means the current dashboard view is not shared; it is only seen by the creator. Shared means it is visible by everyone. 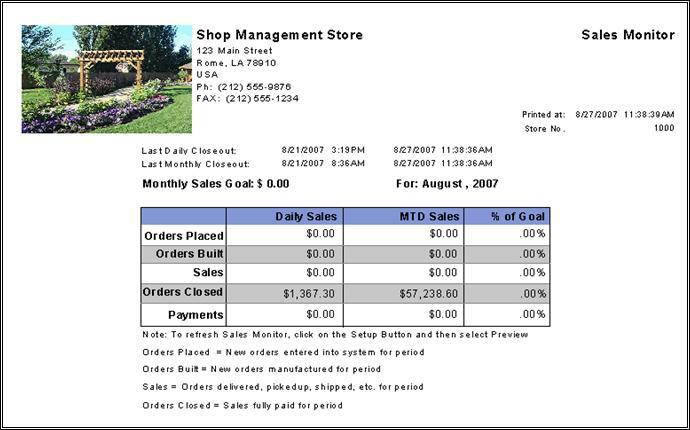 A custom dashboard can be created by modifying an existing one and clicking “Save As”. Clicking the Lock button will lock all of the instruments in the current dashboard in place. You will not be able to minimize or move any of the instruments until you click the Unlock button. Clicking Float will bring all of the open instruments into its own window separate from Control, which can then be manipulated as its own entity. You can minimize it, move it off to the side or even close it. Clicking Anchor will put the instruments back into Control. This is the default General Accounting dashboard available in Control. The customer has the ability to change the instruments shown and save their own custom dashboard. This is the default Accounts Payable dashboard available in Control. The customer has the ability to change the instruments shown and save their own custom dashboard. This is the default Accounts Receivables dashboard available in Control. The customer has the ability to change the instruments shown and save their own custom dashboard. This instrument displays the list of GL Accounts in a tree format. This is commonly used for filtering (selecting) which account will be displayed in the other instruments. You can choose to show active accounts only or all accounts. This instrument provides detailed information for one GL Account. This instrument shows the collection of journal entry (activities) associated with a particular order or bill. This instrument shows the journal (activity) detail screen for the journal entry (activity). This instrument is an explorer that displays all open bills. The setup option for this explorer allows the user to specify the sort order and whether to view all bills, past due bills, or filter by other criteria. This instrument is an explorer that displays all orders in Sale. The setup option for this explorer allows the user to specify the sort order and which fields to display. This instrument is an explorer that displays all open POs. The setup option for this explorer allows the user to specify the sort order and which fields to display. This instrument is an explorer that displays all open Bills. The setup option for this explorer allows the user to specify the sort order and which fields to display. 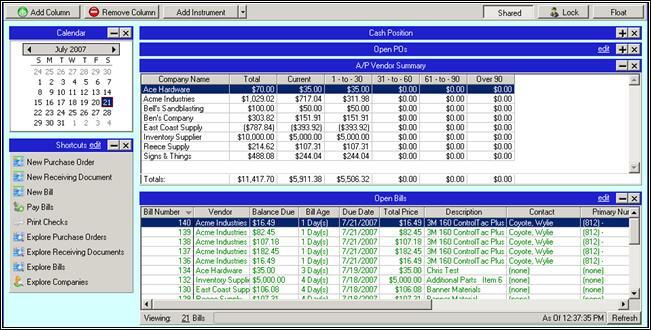 The accounts receivable common task instrument is similar to a Windows XP common task dialog. The setup allows the user to specify the actions displayed in the common task and their order. Valid Tasks have a description and one of the following: Actions, Reports, Web Links, and Command Line Prompts. They are stored as an XML record in the database. The user has the option of saving their configuration as the default, reverting to the default, or just saving it as their own configuration. This instrument displays the accounts receivable information for all accounts receivable. This will be a graphical representation of accounts receivable information in bar and pie graph form. Information in bar graph will be broken down by aging (current, 1-30 days, etc.) amount due, and information in pie graph will be broken down by customer's percentage of total amount due. 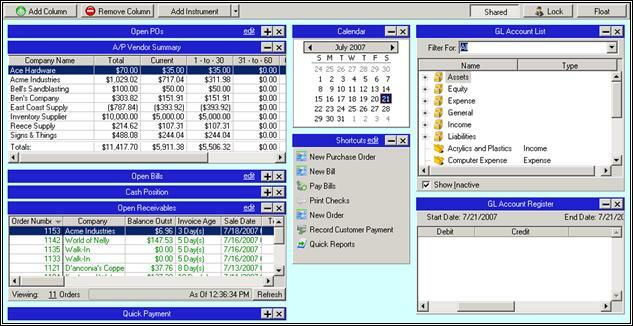 The accounts payable common task instrument is similar to a Windows XP common task dialog. The setup allows the user to specify the actions displayed in the common task and their order. Valid Tasks have a description and one of the following: Actions, Reports, Web Links, and Command Line Prompts. They are stored as an XML record in the database. The user has the option of saving their configuration as the default, reverting to the default, or just saving it as their own configuration. The instrument shows the accounts payable summary (as of the current date and time) for all vendors with a balance greater than zero. This will show a graphical representation of accounts payable information in bar and pie graph form. Information in bar graph will be broken down by aging (current, 1-30 days, etc.) amount due, and information in pie graph will be broken down by vendor's percentage of total amount due. This instrument gives a display of the current sales, MTD sales, and Percent of Monthly Goal achieved to date. The PO common task instrument is similar to a Windows XP common task dialog. The setup allows the user to specify the actions displayed in the common task and their order. Valid Tasks have a description and one of the following: Actions, Reports, Web Links, and Command Line Prompts. They are stored as an XML record in the database. The user has the option of saving their configuration as the default, reverting to the default, or just saving it as their own configuration. This instrument will show the cash position of the company. The cash position shows the balance of funds in bank accounts, as well as undeposited cash, checks, and credit card payments. This instrument is a graphical representation of the Quick Ratio used to show financial liquidity. The Quick Ratio is the ratio of current assets to current liabilities. This instrument shows a list of all the Bill Payments that are marked Undeposited and allows the user to select which Bill Payments to mark as deposited and to select which Bank Account they were deposited into. This instrument lists the top X expense accounts for a given time period. 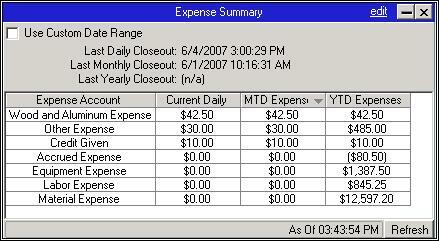 It is similar to the income summary, but shows expenses. The user has the ability to use the default dates (Day, Month, Year) or change the dates displayed using a date instrument. The summary should auto-refresh based on a timed interval. 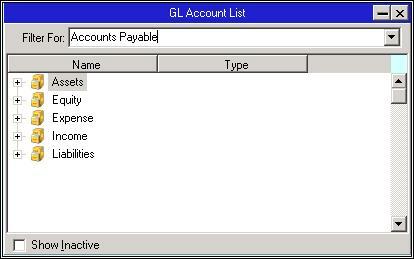 This instrument displays the list of GL Accounts in a tree format. This is commonly used for quickly and easily making a payment for the currently selected Order. It shows the Order number, total amount, and the Balance Due. The Order can also be opened and viewed. This instrument allows you to change the date range that affects other instruments by clicking on the start date and dragging until the desired end date is reached. The desired date range should be highlighted. This instrument allows you to change the date and time range that affects other instruments.